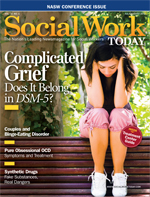 Complicated Grief — Does It Belong in DSM-5? Prolonged grieving exists, but some argue that classifying it as a separate disorder in DSM-5 is unwarranted and may inadvertently encourage unnecessary treatment with medication. Others contend it may get people the additional help they need to heal. After losing her husband of nearly 40 years, Rosalie can’t find the motivation to get out of bed in the morning. She’s lost interest in her daily activities, and she has cut off communication with many of her friends. She claims her thoughts are in no way suicidal, yet she’s clearly expressed that she doesn’t feel she has much to live for either. It’s been eight months since Rosalie’s husband passed. Is it still “normal” for her to have these feelings? That’s part of the debate that is rising as the American Psychiatric Association works on revamping its Diagnostic and Statistical Manual of Mental Disorders (DSM) for a fifth edition due in 2013. There is a push by some to include “complicated” or “prolonged” grief as a disorder, but it’s being met with some objection. Clinicians work with many patients like Rosalie who are struggling to overcome the grief associated with a loss. Grief is one of the most common human emotions, as it’s rare to find someone who has never experienced the loss of a close family member or friend. While it’s something we all must go through, many patients still describe grief as incredibly isolating. That feeling is a common reaction to a loss. Other common symptoms include sadness, numbness, guilt, and even anger. But when those feelings continue for long periods of time without easing in any way, grief can become debilitating. This has come to be known as complicated grief, a condition characterized by the patient’s inability to move on with his or her life. Many symptoms of complicated grief overlap with what has been called—for lack of a better term—“uncomplicated grief.” That automatically opens the door for some disagreement over diagnosing. Most of the controversy involves time frame: At what point does uncomplicated grief cross into the realm of complicated grief? While most clinicians certainly believe complicated grief exists, there is contention over the idea of including it in DSM-5. But M. Katherine Shear, MD, a professor of psychiatry at Columbia University School of Social Work who has been studying complicated grief and has developed a form of therapy for its treatment, says clinicians should not ignore the fact that antidepressants may be helpful in some cases. Shear developed a psychotherapy for complicated grief and confirmed its efficacy with a National Institute of Mental Health (NIMH)-funded grant. In her treatment study, one-half of the participants were already taking antidepressants and still had complicated grief. Interestingly, these same people did better once the psychotherapy was added than those not taking antidepressants. So Shear and her colleagues believe medication may be a helpful addition to psychotherapy for some people and are now testing this hypothesis in another large four-site NIMH-funded study. Other opponents of complicated grief being listed in DSM-5 argue that it should not be classified as a separate entity, that complicated grief is actually a subset of another disorder such as adjustment disorder, depression, or posttraumatic stress. But Shear says there is plenty of evidence that complicated grief should be defined as a separate condition. She calls complicated grief a “loop of suffering” where individuals are essentially “stuck” in their grief and can’t find a way out. People have a natural healing process after a loss, but sometimes this process is blocked or derailed. The resulting condition includes acute grief symptoms, such as yearning and longing, and other intense emotions and complicating problems, such as rumination or avoidance or ineffective emotion regulation. Dealing with sadness is different from dealing with fear. “Trauma is something that’s very difficult, but you can find a way to put it behind you. Loss is forever, and you have to learn to live with loss,” Shear says. But it’s the duration of symptoms being defined in the DSM that Tecala finds unrealistic. In DSM-III it was considered normal to grieve for up to one year. In DSM-IV, it was shortened to two months. “I’ve never seen anyone who does well after two months,” Tecala says. For DSM-5, the proposal aims at a diagnosis of complicated grief as soon as six months after a loss, but many argue that this is still shortsighted. Shear says the controversy surrounding this time frame is understandable since grief progresses differently based on the circumstances of the loss. However, she believes there is a misconception that proponents of a DSM classification, such as herself, are suggesting there is a time frame to complete grief. She says grief is never completed. Bowen says part of the problem is that Americans as a whole simply aren’t comfortable with death. Many try to ignore the fact that it happens. Therefore, when an individual experiences a loss, he or she is often rushed through the grieving process. Other cultures, Bowen says, handle grieving much more effectively. They understand the power behind memorializing their loved ones and the fact that grieving is a process. Many Americans typically devote only two or three days to focus on their grieving—maybe a viewing one day and a funeral the next. Still, those pushing for the DSM inclusion continue to come back to the idea that it may allow the patient to get more of the help they need to move on.